WHEREAS, Owner has purchased the certain tract or parcel of land more particularly described on Exhibit “A” attached hereto and incorporated herein by reference (the “Property”) which Property has been developed as a retail shopping center (hereinafter “Shopping Center”), and desires to enter into this Agreement for the purpose of delegating to Agent any or all of the powers and authority of Owner in any way relating to (i) the management and operation of the Shopping Center and (ii) the leasing of any and all space within the Shopping Center (all of the aforementioned being collectively called “Duties”). Section 1.01 Delegation of Authority. Owner hereby grants and delegates to Agent all of the authority, powers and duties of the Owner specified herein. It is the express intent of this Agreement that Agent is to have the full powers, authority and obligations of Owner in managing and leasing the Shopping Center pursuant to the terms and conditions of this Agreement. The foregoing notwithstanding, the parties agree that Agent shall obtain the written approval of Owner to each lease (and the re-negotiation of any lease) for premises in the Shopping Center prior to executing the Lease on behalf of Owner. Section 1.02 Contracts with Other Entities. Agent is hereby authorized to contract with and employ the services of various entities and service providers, at Agent’s sole discretion, to assist Agent in the performance of the Duties and other services in connection with the operation and management of the Shopping Center, the charges and costs for of which shall be included, and no greater than, the amounts to be paid by Owner to Agent as provided below. (a) Repairs: To cause to be paid by Owner all costs and expenses from the operation of the shopping center (i) to maintain, or cause to be maintained, the Shopping Center and common areas thereof to the same extent the Owner is required to do same; (ii) to make, or cause to be made and supervised, repairs and minor operations required for the installation of tenants; (iii) to purchase supplies required for the operation and maintenance of the Shopping Center after prior approval by Owner, and (iv) to cause all repairs and/or emergency repairs if, in the opinion of Agent, such repairs are necessary to protect the Shopping Center or any part thereof from damage or to maintain services of the tenants as called for by their lease agreements. Owner empowers Agent to authorize emergency repairs without prior consent by Owner. (b) Employees: All persons so selected and employed as a result of this Agreement by Agent shall be deemed to be employees of Agent and as such shall be covered by Agent’s worker’s compensation insurance. Owner shall have the right to request proof of insurance at Owner’s discretion. (c) Service Contracts: To enter into contracts, subject to prior approval by Owner, for any service that Agent shall deem advisable for the successful performance of the duties hereunder, provided that any costs and expenses required to be paid shall be paid or caused to be paid directly to such service provider by Owner. (d) Miscellaneous Powers: To exercise any other powers, duties and authority which Agent deems to be incidental and necessary for the successful completion of the Duties as contemplated by this Agreement. (e) Covenants: Agent covenants to use due diligence and care in the exercise of the power and duties conferred upon and assumed by Agent in this Article II hereof. (f) Direct Payment by Owner: Notwithstanding anything contained herein to the contrary, Owner shall be directly liable for all costs and expenses for utilities, maintenance, repair, taxes and insurance of the Shopping Center, which shall all be invoiced to Owner directly by such service providers, taxing authorities and insurance companies, respectively. Section 3.01 Leasing Fee. 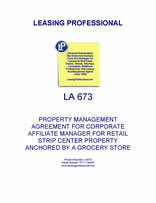 When Agent is the only real estate agent responsible for causing a tenant to execute a lease for space in the Shopping Center, Owner shall pay to Agent as compensation for the leasing services rendered under this Agreement, an amount equal to four percent (4%) of the total rent payable under the lease (the “Leasing Fee”). (For the purposes of this Section 3.01, the term “total rent payable under the lease” shall mean only the rent payable under the lease and shall not include additional charges such as common area maintenance charges, tax charges, insurance charges or other charges generally referred to as additional rent.) When there is another real estate agent who represents a tenant and together with the Agent is responsible for causing a tenant to execute a lease for space in the Shopping Center, Owner shall pay to Agent a Leasing Fee of six percent (6%), and Agent shall be responsible for compensating the other agent. Agent shall be paid a Leasing Fee of two percent (2%) or an amount equal to $2.00 per square foot of the tenant’s space, whichever is greater, when an existing tenant renews its lease. Existing tenant’s lease negotiations shall be handled by Owner. Section 3.02 Management Fee. The Owner shall pay to Agent as compensation for the management services rendered under this Agreement the greater of $500.00 or 4% of all rents, expense reimbursements and miscellaneous revenues. The Owner shall also pay to Agent as compensation for the management services rendered under this Agreement a fee equal to 15% of common area maintenances charges. The Management Fee is earned monthly and is due not later than fifteen (15) days following the end of the month. A vacancy in the Property or failure by a tenant to pay rent does not excuse payment of the minimum Management Fee.